Why don't you get a de-cat? Better flow, sound, flames and about 4 time's cheaper that a sport cat. You can also gut your current cat empty then weld a steel plate in it so it doesn't feel empty when tapped. 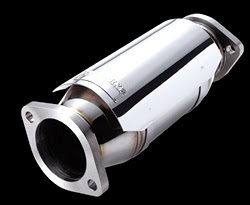 If they do an emissions test then just tell your tuner to run it lean for the test. Just a thought. I have this cat fitted to my vehicle. Quality is exceptional. Good choice sir. I thought that they were pretty loose with tuning rule's in Japan! And i don't think that the police would even know that there was a cat missing on a BCNR33. The cat is located pretty far away from the engine, so most cops thing its somewhere near the engine like on most normal cars. My current BCNR33 came from Tokyo, and already ran a full straight pipe. Its pretty much the loudest car i ever heard in my life! Haha Wonder if the previous owner ever got into trouble. Aussie/Stj - well truth be told if I run the car on a track, I'll probably install a de-cat. But for normal around town driving, it's not worth the risk. As Stj points out, police enforcement might be a bit loose and subjective - but the rules are quite strict. I certainly don't want to draw more attention than I already do. Plus, if I memorialize, in writing, an instance where my car is running around illegally, such evidence could be used against me in a court of law. Not smart. 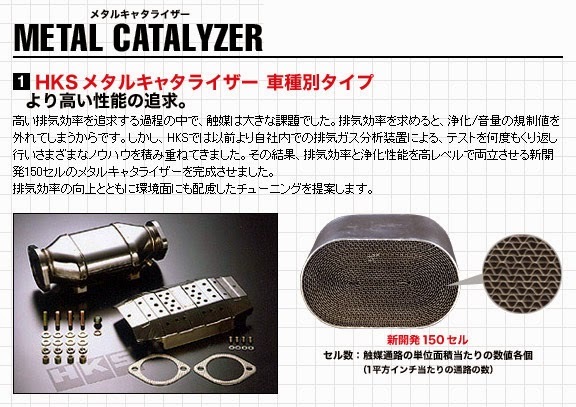 I have a Mines Super Catalyzer on my BNR34. I didn't realise what cells meant when a fellow BNR34 asked how many cells my catalyzer had. I also note that Mines no longer list this part on their website?